Temperature transmitter calibrations are often performed without taking into account temperature sensor performance. For many processes this has been an acceptable practice, although the sensor typically contributes more errors than the transmitter. This practice can be problematic for critical process measurements or those that need a higher degree of confidence or accuracy. Testing the transmitter and its respective process sensor together provides a more complete test. If performed with the proper test equipment, error contributions from the sensor can be minimized by matching the device to the transmitter electronics. Remove the process measurement sensor and install into the dry-well temperature calibrator. Connect the mA measurement jacks of the 754 to the transmitter and connect the dry-well communication cable between the 754 and the dry-well. Press HART to query the transmitter for its configuration. Enable Loop Power on the 754 as required. 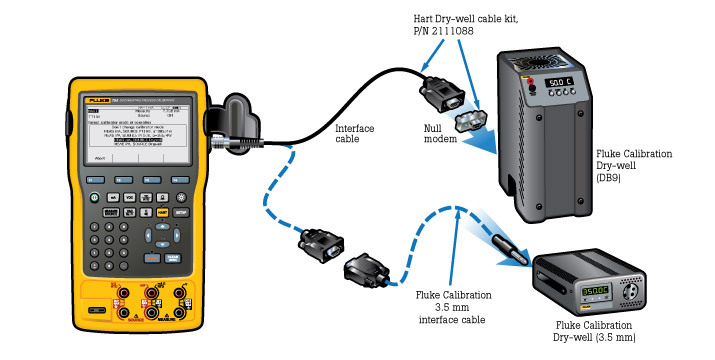 Press HART again and configure the calibrator for the test; select "Measure mA, Source Dry-Well." Select "As-Found" to configure for documenting the test. Be sure to set the delay time long enough to allow the dry-well to change temperatures and stabilize. Record the As-Found test either using Auto-Test, with the settling time for the drywell in the test delay time, or manually while observing for stable test temperatures. After the As-Found test select "Adjust" and select "Yes" when prompted to use a dry-well for adjusting the transmitter input. The applied temperature and adjustment will adjust the transmitter input block to output the correct measurement by adjusting the transmitter and sensor’s output together. After adjusting the input with sensor, adjust the transmitter mA output using "Output Trim." After adjustment is completed, record the post adjustment of the transmitter As-Left and errors of the input. Sensor and output errors of the transmitter should be nominalized, resulting in improved temperature measurement performance.